I'm not referring to this with naturally brown hair : I'm talking about those who complain that their hair isn't as black as mine (even relaxed hair needs not to be brown). 1. The first reason is dry hair. When your hair lacks moisture, you'll experience dry and brittle hair and the sun light worsens the situation hence you get that brownish tint. What you need to do to remedy the situation is infuse moisture into the hair in form of deep conditioning and green house effect. In a matter of weeks, you'll notice a difference. 2. Not protecting your ends can cause that brownish colour therefore try to keep your ends tucked away especially during harmattan. 3. Relaxing your hair too often or back to back like we used to causes over processed hair which is the brownish colour you see. 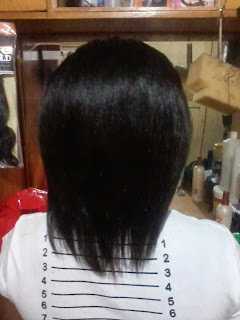 When you begin spacing the relaxer application, you'll notice that your old hair will only be the damaged parts. Apply the relaxer to only the new growth else if you do it all over the ends too, you'll suffer dry and brittle hair and discolouration. Do You Oil Your Scalp?